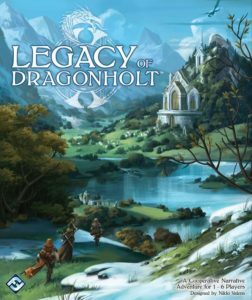 Concepts: Legacy of Dragonholt is a fantasy adventure campaign for one to five players, although it may optimally suit two the best. Set in a village in the realm of Terrinoth (which fans of Fantasy Flight’s Runebound setting will be familiar with), the players control a group of motley adventurers who have settled in the rural village of Dragonholt. There and in the surrounding areas, they undertake quests and make friends, all the while attempting to uncover a sinister plot to usurp the throne. Between quests, characters can choose to take part in a variety of scenes around the village of Dragonholt, which allow the player to interact with a huge cast of NPCs that serve to flesh out the world. The core concept here is solid and has a considerable amount of attention to detail. Writing: The vast majority of this game is focused on the narrative. The first step of the game is to design your character, and the text directs a large focus to considering your character’s personality, outlook, history and goals; this is an excellent example of the game’s character-driven nature. 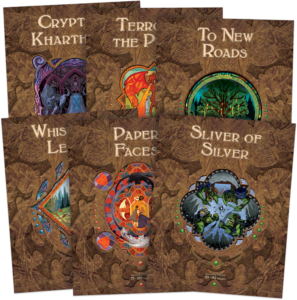 The campaign comes with six booklets that each contain a quest. Several of these are mandatory, and you will play through them during the course of the campaign’s main storyline, whilst a couple will require additional effort in order to find them. These quests incorporate multiple action scenes, all of which is paced excitingly, ensuring that the combat and adventure flows at an involving pace. 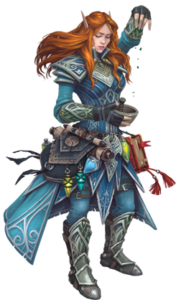 However it is in the game’s main book for Dragonholt Village, a hefty tome that occupies most of the time that your character is not out on quests, that Valens’ storytelling truly shines. Players have a whole wealth of locations in the village that they can visit, each of which is inhabited by a rich and diverse cast who possess their own storylines as well. By getting involved in the lives of the local community, characters can discover their secrets, share in their joy, resolve their conflicts, be invited to weddings, and more. This is a fascinating level of immersion, and it means that the more the player gets involved in the lives of their favorate NPC, the more that they are rewarded with even more! This very quickly becomes the game’s greatest appeal, being so full of charming and loveable characters that the player simply can’t help but fall in love with. Although it should be warned that you may not want to play this game on an empty stomach, as Nikki Valens takes extremely lavish enthusiasm to describing your character’s big dinners – so if you’re half Hobbit, you may want to be careful so as to avoid chewing on the pages. Mechanics: The game’s mechanics are smooth and very elegant, but also suffer from being quite poorly described in Fantasy Flight’s description of the game. Legacy of Dragonholt is entirely played out through text. Decisions made at the end of each passage of writing direct the player to another passage, giving the game a decidedly ‘choose your own adventure’ vibe – but one that is far more complex than the type that many would have seen before. This game comes without dice or any other random elements. Instead, players select from a range of skills when they create their character, with the possibility to gain more during gameplay. When the player comes to a passage of text that would require a challenge, the player is asked if the character possesses a certain skill. If they do, the result is generally more positive – and often less life-threatening. However it may not always be clear as to which skill will be required, especially in the heat of battle, so some level of careful choices is always required. The game’s mechanics are built to ‘remember’ important decisions that are made by means of telling the player to mark an alphanumeric code whenever such a trigger has been activated. Later passages will ask such as “If C5 is marked, turn to…” to aid in creating branching narrative passages. In addition to this, throughout the game players will need to keep track of several scores, such as time (used to measure which of the locations such as stores and taverns are open), or progress (used during large boss fights in order to measure how much damage a monster has taken, typically within a set number of text passages), which works to give the player situations to plan towards and short-term goals to achieve. Design: In terms of artwork, the game is aesthetically charming and atmospheric. Images are rare, namely used on the covers of each book with the exception of the character creation booklet which includes several high-detailed coloured portraits. One element of the game’s design that should be mentioned is the clear focus on representing a wide breadth of diversity in the setting’s inhabitants. The game has already received plenty of grumbles of discontent from the subset of gaming audiences that dislike seeing space in products being given to non-male and non-cisgender characters, and those type of players will doubtless find this game’s consistent and unapologetic determination to include a full and varied cast to be quite unappealing. But for everybody else, the game’s vast cast serves as a wonderful example of a rich world full of diverse and fully realised characters, from many different points on the LGBTIQ spectrum, who are shown in this game’s setting as being valid and free from the real-world prejudices and moral judgements. Playability: You may think that a game of this nature would have somewhat limited options for replay, and that would be somewhat true. The downsides to the linear nature are mitigated, though, by several appealing factors. As mentioned above, the writing follows multiple storylines for each of the NPCs, which can give the potential to replay in order to locate more branching narratives and discover new options. The game also has four possible endings, of which some are… ah, we need to talk about this. Okay so, potential for spoilers in this section of the review, which you may hight to view. At roughly the mid-point of the campaign, the players encounter a quest to rescue the kidnapped son of Dragonholt’s noble family. The young boy has the very distinct possibility of not surviving the quest and in our play he died. His death is felt heavily throughout the rest of the story, with many scenes echoing a sense of loss and mourning and the boy’s sister blamed the character for her brother’s death. You never have the chance to prove your good intentions towards her. From that point, the best ending that you could hope for was, although still victorious, bitterly so and fairly depressing, mainly because there is so little in the way of means to turn around this route once you are past the fateful mid-point quest. Whilst this can be easily remedied with some foreknowledge of the requirements for this, it seems to be an especially brutal conclusion without any clear method to work towards a redemption arc. We will definitely be replaying this game, but will definitely be bearing this in mind and will strongly work to avoid. Conclusion: Despite the rather hefty issue discussed above and a rather considerable price tag, Legacy of Dragonholt is an exceptional game. We played this as a ‘couples game’ for two players, but it works equally well for families (with advisement for some violent content but nothing beyond your typical epic fantasy movie). In many ways this is a product that feels both ground-breaking and hearkens back to the classics. Final Thoughts: If you love games with a strong focus on narrative which is also an intuitive pick-up-and-play campaign in a box, this is a must.